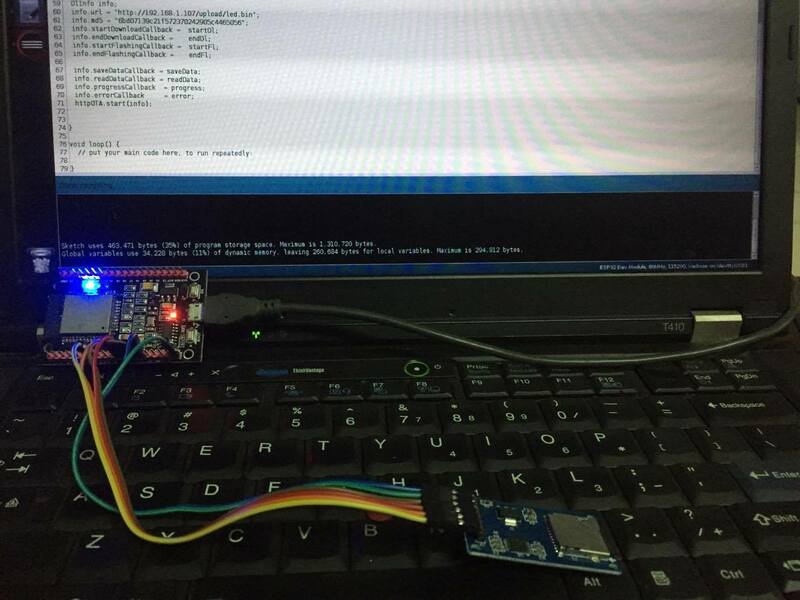 Refer Demo 7 to connect ESP32 pins with sdcard module. And Demo 1 to connect ESP to LED. I made the library in github. Just download, install it and run example esp32httpota2. Change the Wifi ssid, password and IP of MQTT server according to yours. The code will be explained below. 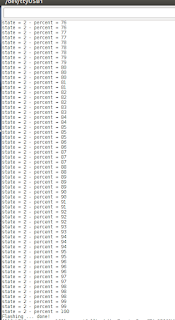 In order to start fota updating process, using the Python code below and type "1" to publish FOTA command to ESP. The ESP will receive the command, parse it and starting FOTA process. Change the url and md5 value according to yours. - url: is the http url of the firmware file. - md5: is the md5 checksum of the firmware file. - startDownloadCallback: is the function that will be invoked before starting downloading. I left it empty in this demo. - endDownloadCallback: is the function that will be invoked after downloading was finished. I left it empty in this demo. - progressCallback: is the function that will be invoked to show the progress of downloading and flashing process. - errorCallback: is the function that will be invoked to show the error of downloading and flashing process. The functions: saveData, readData, progress, error, startDl, endDl, startFl, endFl will be invoked by the library in the update process. They are assigned to the members of DlInfo structure. The function receiveCallback will be invoked whenever ESP received the MQTT command. It will check if the topic is OTA_TOPIC then parsing the payload to get url and md5 value of firmware file. After that, it change the state of system to Fota_e to start updating process. After finishing the whole process, the code "client.publish(OTA_TOPIC, "ok");" will publish message "ok" back to Python application. 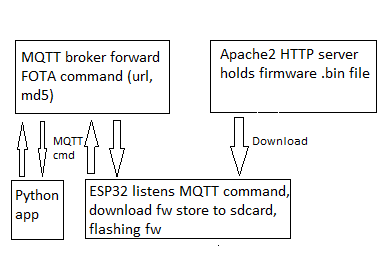 When the system is in Running_e, it just listen the MQTT command. Are there any examples to do OTA that is not Arduino based ? I did eventually get this to work...once. There seems to be a hidden length limit to the URL+MD5 combination (I thought it was 128 chars total, but it seems to be less than that. Once I shortened them, I got ONE successful upgrade, but only after http.GET() failed a few times. 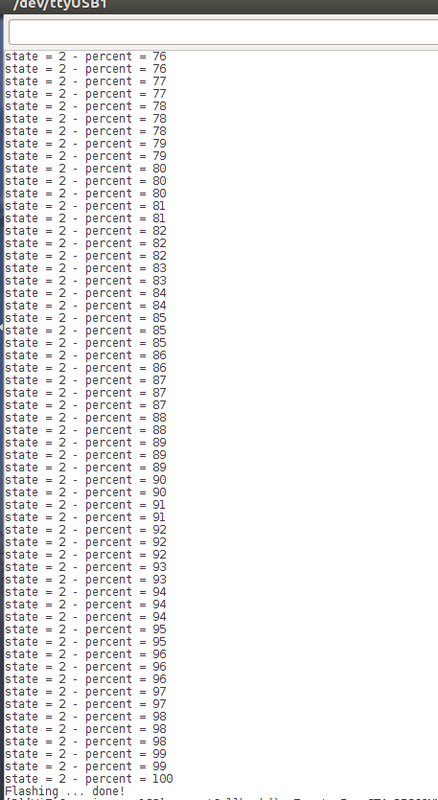 After that one success, the http.GET() fails every single time, returning -1, and it's not clear what's going on. Is their any license information available for your library? how can I check or calculate the MD5?